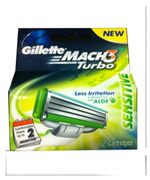 Buy Gillette Mach3 Turbo Sensitive 2 Cartridges. Shaving force across the blades for significantly less irritation & comfort. Gillette Mach3 Turbo Sensitive 2 Cartridges his creates a shaving surface that distributes the shaving force across the blades for significantly less irritation and more comfort. Get the cleanest shave every morning with the Gillette Mach 3 Turbo Sensitive Cartridges. These are the ideal companion for your Gillette Mach 3 handles. Its protective functioning negates the chances of nicks and cuts which can mar your groomed up appearance. Increase your glamor quotient and make other men envy you with your elegant and clean-shaved looks. These cartridges go on and on giving you full value for the money you spend on them. his Gillette has 2 cartridges for you replace after your shaving. The pivoting head helps the razor automatically adjust to the direction your shaving in. The precise pivot will smoothen your shave by gently following every curve of your face. A comfortable razor like Mach 3 Turbo will keep you on top of your game. You can master and experiment different styles on your face using this Gillette Mach 3 Turbo.